The Embryonics Project was a European research project developed in the late 1990s, whose aim was to create a bridge between biology and electronics, and in particular between the embryonic development of biological organisms and digital circuits, in order to design highly robust integrated circuits. Indeed, the name Embryonics itself is a contraction of the words embryonic and electronics. By adopting certain features of cellular organization, and by transposing them to the two-dimensional world of integrated circuits on silicon, this approach enables certain properties unique to the living world, such as self-replication and self-repair, to be applied to artificial objects (integrated circuits). Applications that require very high levels of reliability, such as avionics or medical electronics. Applications designed for hostile environments, such as space, where the increased radiation levels reduce the reliability of components. Applications that exploit the latest technological advances, and notably the drastic device shrinking, low power supply levels, and increasing operating speeds, which accompany the technological evolution to deeper submicron levels and significantly reduce the noise margins and increase the soft-error rates. Applications that will need to be executed flawlessly on highly flawed substrates, such as future nano-electronic devices, which could potentially share some features with living organisms. Multicellular organization, whereby an organism is divided into a finite number of cells, each realizing a single function. Cellular division, seen as the process through which each cell is able to duplicate, copying its genome and splitting into two daughter cells. Cellular differentiation, which defines the function to be realized in each cell, a specialization that essentially depends on the cell’s position within the organism and is obtained through the expression of a part of the genome. These three properties illustrate the fact that, in a multicellular organism, each cell contains the whole of the organism’s genetic material and is, to an extent, "universal". Therefore, in the presence of a physical degradation, each living organism is potentially capable of self-repair through the self-replication of its cells. A human being consists of approximately 60 trillion (60x10﻿^12﻿) cells. At each instant, in each of these 60 trillion cells, the genome, a ribbon of 2 billion characters, is decoded to produce the proteins needed for the survival of the organism. This genome contains the ensemble of the genetic inheritance of the individual and, at the same time, the instructions both for the construction and the operation of the organism. The parallel execution of 60 trillion genomes in as many cells occurs ceaselessly from the conception to the death of the individual. Faults are rare and, in the majority of cases, successfully detected and repaired. This process is remarkable for its complexity and its precision. Moreover, it relies on completely discrete information: the structure of DNA (the chemical substrate of the genome) is a sequence of four bases, usually designated with the letters A (adenine), C (cytosine), G (guanine), and T (thymine). Within the Embryonics project, the application of biological ontogenesis to the design of digital hardware was studied for several years. 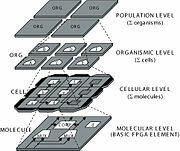 Among the main contributions to the field of programmable electronics was a self-contained representation of a possible mapping between the world of multi-cellular organisms in biology and the world of digital hardware systems, based on four levels of complexity, ranging from the population of organisms to the molecule. Within this mapping, an artificial organism was defined as a parallel array of cells, where each cell is a simple processor that contains the description of the operation of every other cell in the organism in the form of a program (the genome). For a given application, all cells are structurally identical and contain the same program (and can thus be seen as stem cells), but different parts of the program and of the structure are activated depending on the cell's position within the array, implementing cellular differentiation. Moreover, the cells are application-specific, that is, they are structurally and functionally adapted to the application to be executed, again in keeping with the biological inspiration (a skin cell is physically different from a liver cell). To achieve this property, the cells are redefined as reconfigurable processing elements, realized by custom programmable logic circuits (FPGA) that fulfil the role of molecules in the system. Dedicated hardware within the FPGA implements special features, such as growth, adaptation, and self-repair, that are both highly unusual in computing devices and potentially useful in view of the latest technological advances. An Embryonic machine is an electronic system, conceived following the four levels of complexity defined above, that exhibits some of the features enabled by such an architecture, such as growth, self-repair, and self-replication. The design that, to date, best exploits the features of an embryonic machine is the BioWatch, which exhibits growth and self-repair capabilities. This demonstration system, which counts hours, minutes and seconds, was implemented on the BioWall, a bio-inspired computing surface consisting of several thousands of FPGAs, touch sensors and LEDs displays. C. Teuscher, D. Mange, A. Stauffer, and G. Tempesti. "Bio-inspired computing tissues: Towards machines that evolve, grow, and learn". BioSystems, 68(2–3):235–244, 2003. G. Tempesti, D. Mange, E. Petraglio, A. Stauffer and Y. Thoma. "Developmental processes in silicon: an engineering perspective". In Proc.2003 NASA/DOD Conference on Evolvable Hardware, pages 255–264, Los Alamitos, CA, 2003. IEEE Computer Society. D. Mange, M. Sipper, A. Stauffer and G. Tempesti. "Towards robust integrated circuits: The Embryonics approach". Proceedings of the IEEE, 88(4):516–541, 2000. D. Mange, M. Sipper, and P. Marchal. "Embryonic electronics". In BioSystems, volume 51, pages 145–152, 1999. G. Tempesti, D. Mange and A. Stauffer. "The Embryonics project: a machine made of artificial cells". In Rivisita di Biologia-Biology Forum, volume 92, pages 143–188, 1999.